Elder care service providers are continuously growing due to rising number of older patients suffering from disabilities and improving day care facilities. Hence, companies are more focused in wireless connectivity and advanced devices to deliver healthcare services. In order to meet customer needs, elder care service companies are entering into various private care centres because older people tend to choose living in care facilities with specialized services requirements, which are provided in private care centres. Chronic conditions of elderly and preventive care technology are opening up niche markets. Moreover, the driving factor of such day care facilities is the overall cost of the setup, which is comparatively less than hospitalization. The day care facility is provided for 10-12 hours a day and is also expected to fuel elder care services market growth in terms of revenue over the forecast period. The global elder care services market is anticipated to record a Year-over-Year (Y-o-Y) growth of 8.5% and reach a market value of US$ 1,919.8 Bn in 2026. By service type, PMR has segmented the global elder care services market into home-based care, community-based care and institutional care. When compared to all the segments in global elder care services market, institutional care segment had the largest market share in 2017 and is projected to grow over the forecast period with highest CAGR of about 10.3%. Home-based care and community-based care segment revenue share is expected to grow owing to increase in adoption rate. Europe elder care services market revenue is likely to grow at the highest CAGR over the forecast period. Increase in the total number of elder care services provider along with increase in private-run institutions are likely to propel growth in the revenue of the elder care services market in the region. As per PMR market analysis, the US elder care services market is likely to register at a CAGR of 7.1% during the forecast period owing to increase in government investments and increasing demand for retirement living and high cost of hospital centric cost system in the country. The total number of elder care companies in Europe is higher as compared to other regions. However, several companies are strategically entering in order to increase the number of facility, which is likely to drive the overall elder care services market revenues in the region. 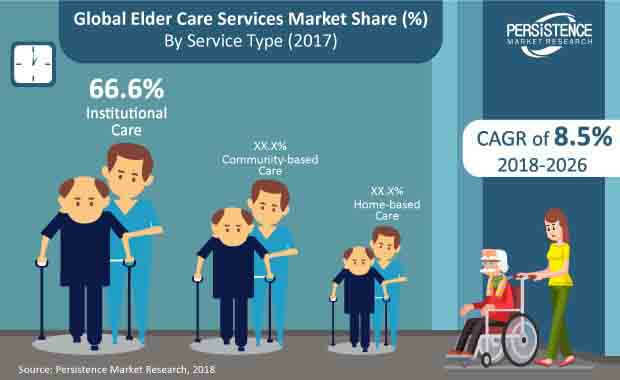 Asia pacific elder care service market is projected to expand at a high growth rate in terms of Y-o-Y (Year-on-Year) over the projected forecast period.